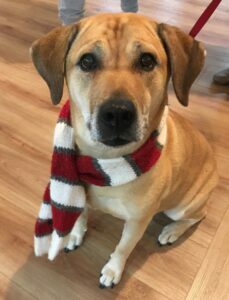 Kayla is a female Golden Retreiver Mix. She was rescued at the age of three from the OSPCA after a tough start at life. Over the past six years she's been given an abundance of love and comfort. Kayla is now a gentle and compassionate registered therapy dog. Kayla is comfortable around everyone she meets, including all other animals. She loves meeting new people and enjoys spending time sitting and listening to their stories. She is very quiet and calm, and can often be found relaxing with people or going for a leisurely walk. Kayla received her certification as a Canadian Therapy Dog through the ADA in 2017. She is the ideal companion therapy dog for a senior. Copyright © 2018 Simcoe Senior Services Inc.